Our mission is to develop and maintain long term relationships with our customers by exceeding demands and expectations before, during, and after job completion. 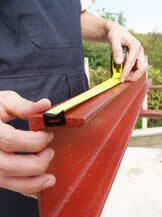 Providing quality workmanship and exceptional service at an affordable price. Ed's Contracting specializes in all aspects of home improvement. From painting, roofing and room additions to drywall and flooring. We do everything! We stand behind our work and take pride in making sure that our work is done in a timely and efficient manner. We work with homeowners, management companies, homeowner associations, apartment complexes and businesses to provide the best service possible. Call us and we will come out and provide you with a free estimate! We will then mail, fax or email you a copy of the estimate. When you decide to schedule the job, just call our office and we will set up a convinient time that works with your schedule. Ed’s Contracting can handle any of your carpentry needs. We provide many carpentry services such as installing trim work, and hardwood flooring, replacing rotten wood, building decks, cabinetry work and more. We combine modern techniques with highly skilled carpenters to provide fine craftsmanship in all of our carpentry projects. A deck can add to the value and appearance of your home. If your deck is in poor condition it can reduce the value to your home and become a distraction to the neighborhood. 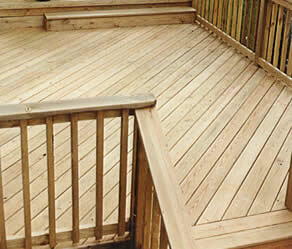 Ed’s Contracting can build you a beautiful deck that meets all of your family’s needs. If you need to find design ideas for your new deck we recommend you look at the following sites. We can buy the plans directly from them and build it for you.